To ensure each Jamestown student is encouraged and inspired to achieve academic excellence and seek healthy lifestyle choices, by sustaining innovative and unique opportunities for learning. 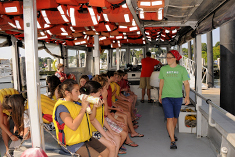 Jamestown Education Foundation (JEF) is a private, non-profit 501(c)(3) corporation. We rely on financial contributions from both private parties and corporate sponsors to fuel innovative learning that encourages academic excellence and healthy lifestyles for Jamestown youth, regardless of the school system they attend. Funding from the Jamestown Education Foundation goes to programs that are made available to students at Jamestown public schools and through a variety of local organizations. 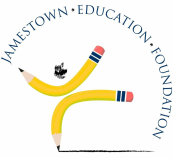 Donations to the Jamestown Education Foundation are distributed to beneficiaries through the award of grant monies and ongoing support for sustainable programs. If you are interested in applying for a grant, please click here. The Jamestown Education Foundation and its Board of Directors​ is an entirely volunteer organization. Continued support is the key to keeping our mission alive as we refine our existing programs and fund new ones. If you are not already a supporter, please consider joining us in our efforts by volunteering or making a donation. After-school enrichment like karate, yoga, art, intermural sports, golf, Spanish and Mandarin, coding, Stop Motion video making, drama club and more! Chess Masters to help build character and develop young minds through the age-old game of chess. Makerspace development in both Jamestown Schools where students are encouraged to come up with models, prototypes and solutions to real-world problems. JEF has funded 3D printers, a laser printer, Little Bits electronic building blocks and more. Literacy programs including the Melrose Summer Reading program which fosters the love of reading in all children and helps develop positive attitudes about reading and books and motivate kids to maintain their reading skills during summer vacation and the Rhode Island Rooster Games for 5th graders. Collaborative efforts such as Science and Math Scholars (SAMS) curriculum in middle school and Think, Think-Shape-Grow Water Program for 3rd graders in which students study a community where all fresh water comes from precipitation so they can plan, investigate and compare data to propose solutions to the problems around water scarcity. Annual Enrichment Grants are awarded each spring to educators and community members who apply for funding to support programs that demonstrate creativity and innovation in education. Mini Grants are awarded on a rolling basis throughout the year, and are typically for projects with budgets under $1,000.